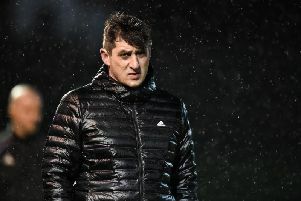 Coleraine manager Oran Kearney was left incensed by the performance of referee Raymond Crangle and his officials on Saturday. Two controversial penalty decisions helped Crusaders wrap up a 2-0 win at The Showgrounds as they consolidated their position at the top of the table. On closer inspection the Bannsiders can feel aggrieved by the calls in either half. The first one five minutes before the break, which also saw Johnny Watt pick up a second yellow card following a tussle with Paul Heatley, occurred at least a yard outside the box. The second, 17 minutes from time, had everyone in the ground scratching their head again. A long ball into the box by penalty scorer Billy Joe Burns was taken well by debutant keeper Chris Johns. The whistle went, with everyone feeling it was for a foul on the young stopper, but referee Crangle pointed to the spot after David Ogilby for a tug on the shirt of Jordan Owens. Burns again dispatched from 12 yards to seal the win and leave Kearney a very frustrated man at the end. “When the league champions come to town you need a certain amount of, not necessarily luck, but I suppose the consistency for things to be done to allow you to give yourself a chance in the game,” said the Bannsiders boss. “I thought our first half performance was well on the way to getting us in at 0-0 at half time and giving ourselves a chance to going and getting something from the game. “My gut feeling at the time was it looked outside. “I’ve since watched the video back and saw photos of the incident and it’s not even close to being inside the box. “The linesman is adamant to me at half time that he’s in line with it and he’s made the call because he’s 100 per cent sure. “But if you’re 100 per cent sure you have to be sure you’re seen the foul happen inside the box. “Yes, everyone ends up inside the box, but the initial foul is probably about two yards outside the box. “It’s like a double whammy for us because we get a red card from it and we also get a penalty given against us. “All of a sudden in the space of five seconds, for all the good work we’ve put into the first half, the game has been turned on its head. “For the second one the ref has made the insinuation that he has given it for holding. “I’m sure there are people holding on to each other, it’s a physical game, but if that’s a penalty there’s 10 penalties in every game. “I thought when the whistle went it was for a foul on our keeper, I think everybody did. Penalties aside Crusaders manager Stephen Baxter felt his side were worthy winners despite the furore about the officials. “They have to officiate the game as they see it, Raymond was right on the spot and he gave it very quickly, that’s often a sign that he’s got it right,” he said.